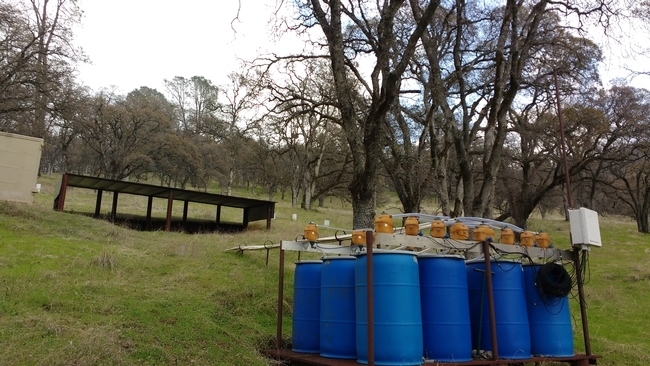 The hillslope and water collection devices that will be used for this experiment. 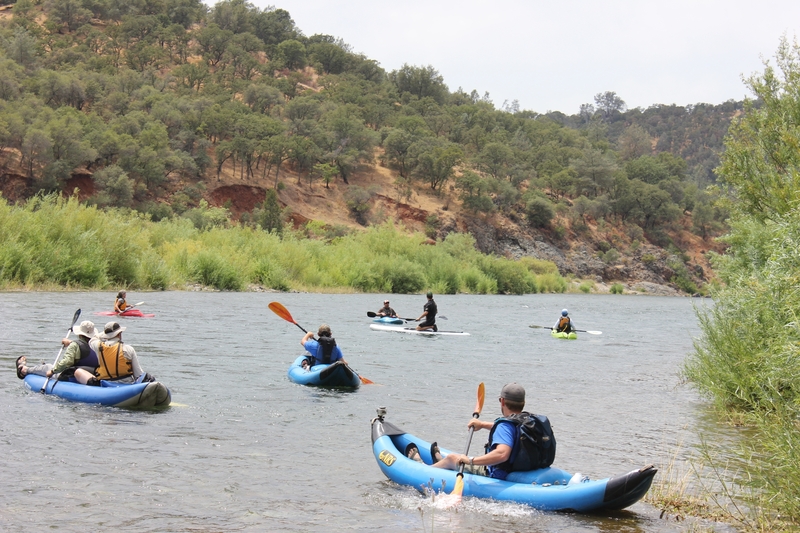 The way rainfall is translated to runoff and streamflow in rivers depends on many complex, interconnected processes in the landscape. Rain falling onto hillslopes, meadows, or forests is either infiltrating into soils or flowing as runoff on the surface of soils. Either way, the moving water is often mobilizing solutes, pollutants, or nutrients along its pathway, which have the potential to contaminate streams and impair water quality. 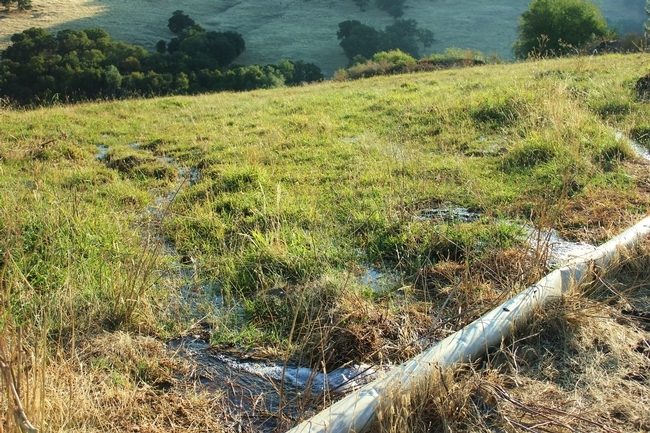 Knowing where these flow pathways occur in the landscape is crucial to prevent pollutants (e.g. excess nitrogen from fertilizer or manure, pesticides, pathogens) from being transported to rivers and lakes, where they can cause algae blooms. 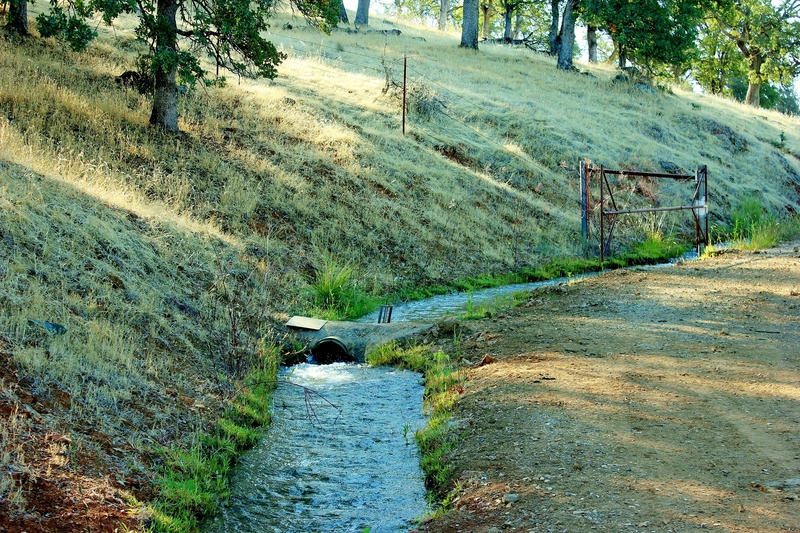 Observation of and understanding where and when runoff is occurring in the landscape and how the moving water is transporting pollutants to streams has been at the heart of hydrological research for many decades and has triggered the Clean Water Act in 1972. The synthetic DNA tracer concept. For many years, hydrologists (e.g. water scientists) have used hydrologic measurements such as streamflow hydrographs (e.g. graphs of streamflow vs time) to characterize hydrologic- and associated transport-flow pathways, however, these methods do not allow for identifying specific pollutant sources and individual flowpaths of concern in the landscape. In recent years, chemical tracers like bromide or chloride and dyes (blue, red, yellow fluorescent colored dyes) have been used to obtain more information, but the variety of unique tracers available from each type is extremely small, thus limiting the identification of multiple flowpaths at the same time. Additionally, once introduced into the system, it is often problematic to reuse the same tracer because of uncertainty in whether old or new tracers are being detected. To overcome the problems that have plagued traditional tracer studies we have developed a new tracer concept that utilizes bio-molecular nanotechnology. We use short, artificially made DNA sequences that are wrapped into a safe, biodegradable polymer composed of polylactic acid (PLA) to protect the DNA from being eaten by microbes during the transport process. Because DNA is made of the four basic building blocks adenine (A), thymine (T), guanine (G) and cytosine (C) (Fig. 1), which can be combined in any random order, our unique DNA-based tracers allow, in theory, fabrication of an enormous number of unique tracers (approximately 1.61 x 1060) with identical transport properties. Because of their unique DNA sequence the tracers have unique IDs, thus, we can use multiple tracers at the same time in the same watershed. 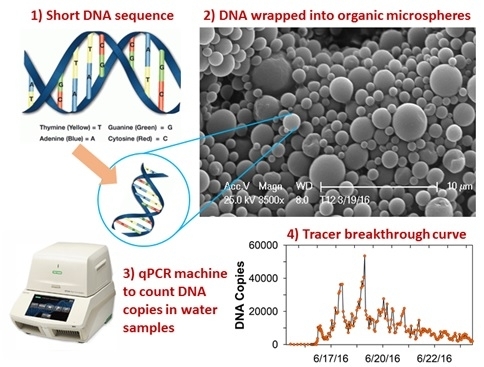 The amount of tracer present in a streamwater sample can be estimated with real-time quantitative polymerase chain reaction (qPCR), a method commonly used in molecular biology, which determines the number of DNA copies present in a sample. Finally, during the tracer fabrication process, we can alter the size of the tracer particles to anything from 200 nanometers (size of a virus) to 1 micrometer (size of colloids or bacteria), which helps mimicking the physical transport properties of the pollutant of interest. In the next two years we will test differently sized DNA tracers in a well-studied, small experimental watershed at SFREC to test their use for identifying hydrologic flow pathways. This study will provide invaluable information for the understanding of processes in hydrologic systems that can be used to improve hydrological and biogeochmical models used to predict transport of pollutants from hillslopes to streams. 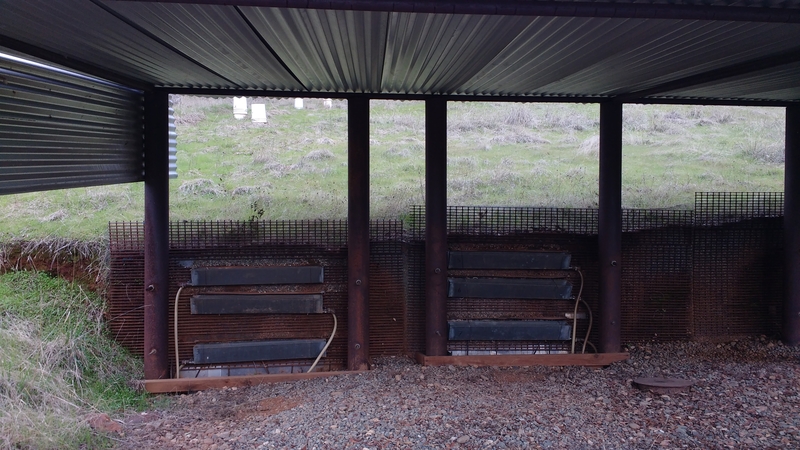 To achieve this broader goal, we will distribute 5 different DNA tracers at 5 different locations at incrementally increasing distances from a trenched hillslope at SFREC and measure the tracer breakthrough curves in a runoff collection system and the watershed outlet. The injection locations will be chosen to represent a range of specific soil-landscape characteristics such as places with relatively deep soils, shallow soils and areas where flow visually concentrates in the landscape. With the tracer experiments we also hope to quantify preferential flow pathways (e.g. macropore flow) in the watershed. Preferential flow is hypothesized to lead to shorter travel times of water and pollutants through soils and the vadose zone. Because of the variable size of our DNA tracers (0.1-0.4 µm) they could be particularly useful for quantifying macropore and preferential flow because we expect that a small fraction of the tracers will be filtered out in the soil matrix while the majority of the DNA tracers will move along the most rapid flow pathways. 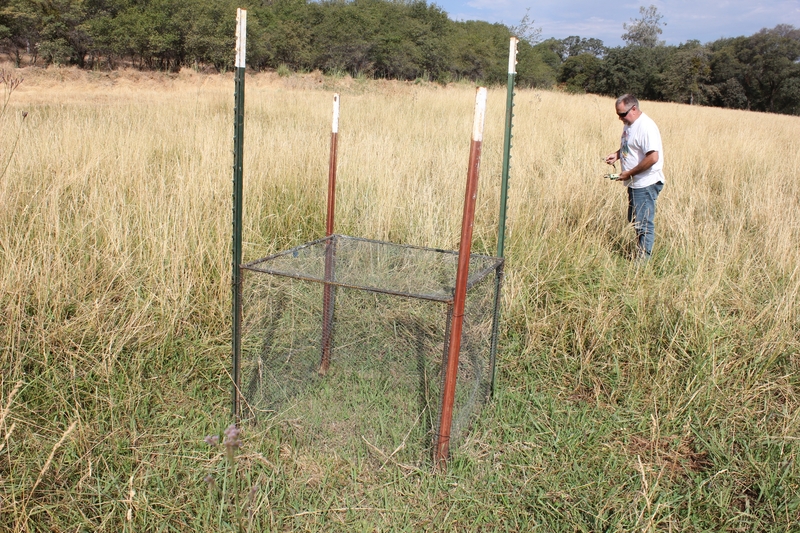 The results from these experiments, if successful, will provide improved estimates of the time it takes for water and solutes to travel through the soil to streams, which will allow us to more accurately predict the risk of pollution of streams and surface water bodies during storm events. 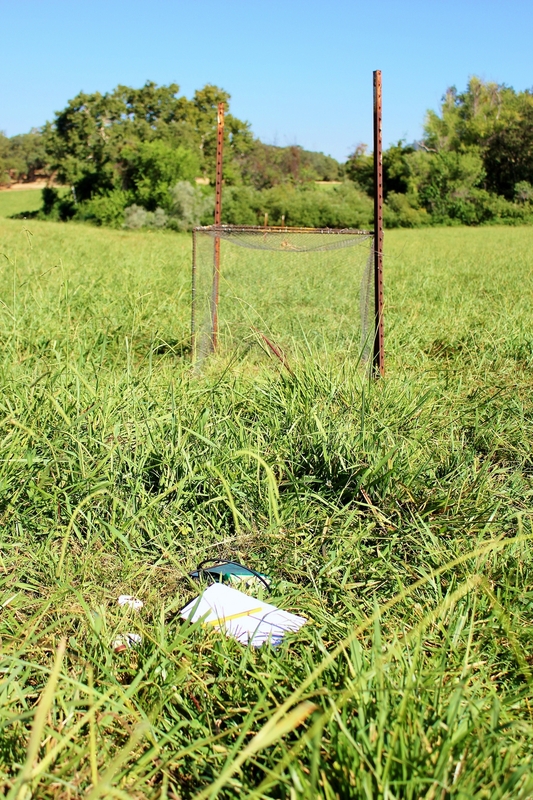 By separating the water collection by soil horizon, it is easier to determine how pollutants would flow through the ground. The current water crisis and threat of reduced water supplies has irrigators in a critical position to ensure each application of water is maximized. An ongoing project at the Sierra Foothill Research & Extension Center, led by Larry Forero, UCCE Director for Shasta County and Livestock and Natural Resources Specialist, examines pasture irrigation efficiency and timing to provide potential solutions for limited water resources. 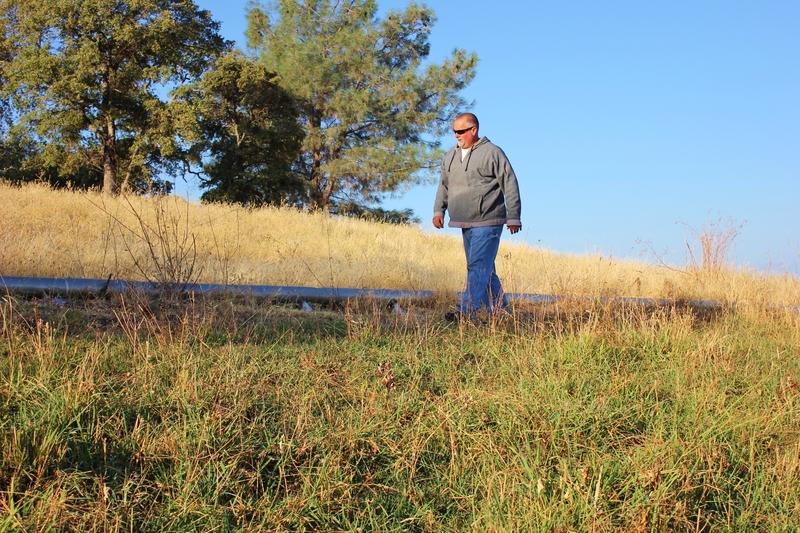 For this project, researchers and staff regularly monitor and assess four factors associated with the production of foothill flood irrigated pasture utilizing pipe and ditch delivery methods. 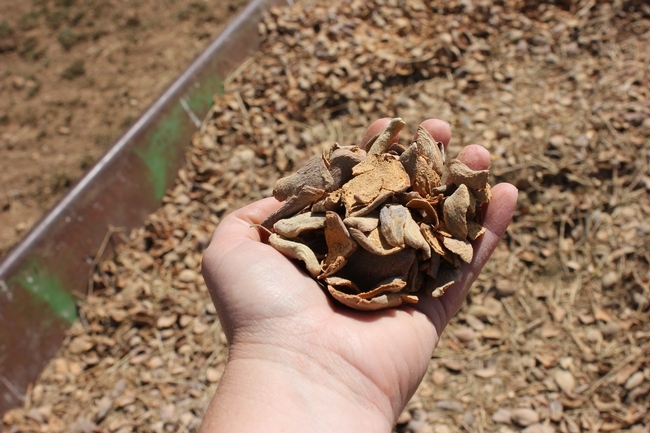 These factors include the amount of water applied to the pasture, the amount of water run-off, the effectiveness of irrigation, and the production of the pasture (measured in biomass and AUM harvest). Soil moisture monitoring is a simple yet useful method utilized to determine irrigation efficiency. 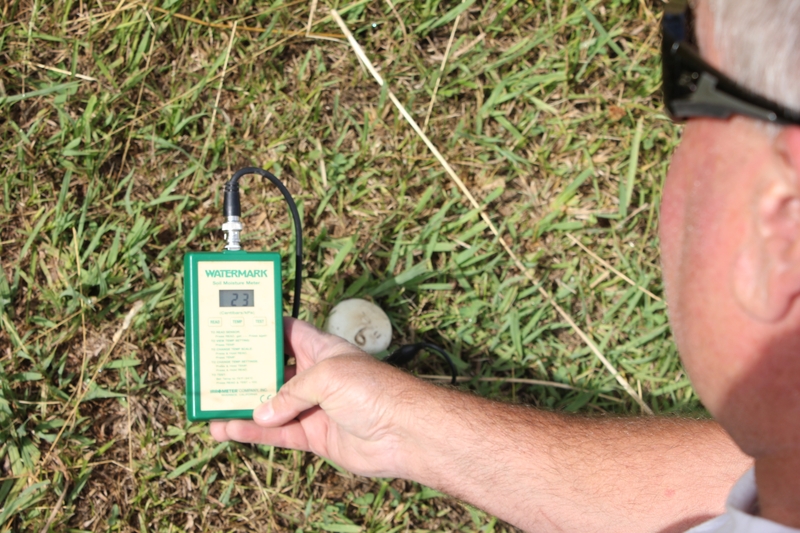 Ranging in price from less than ten dollars to several hundred dollars, soil moisture sensors allow irrigation managers to measure water levels beneath the surface and at different locations throughout the field. 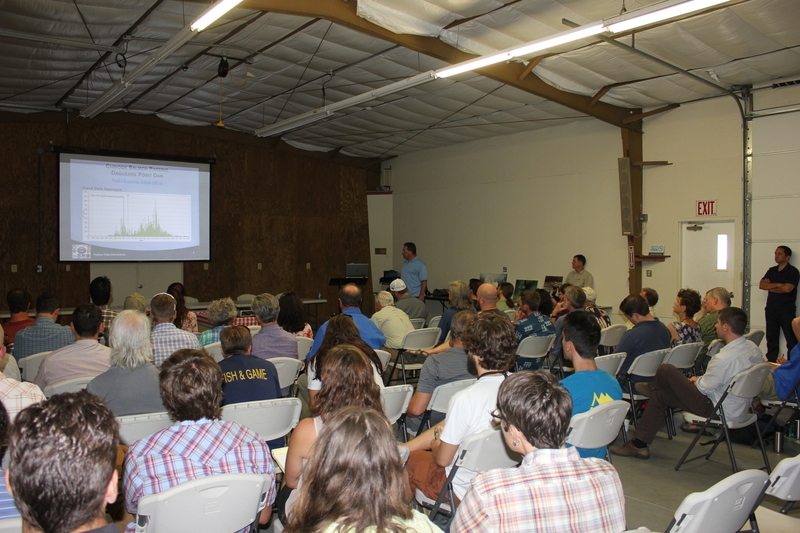 Preliminary findings indicate that the interval between irrigations could be lengthened in the fall as the days shorten and become cooler. Fewer applications result in less water being used, saving ranchers time, money, and stress. The monitoring for this project will continue through the summer and fall, so check back for additional updates. 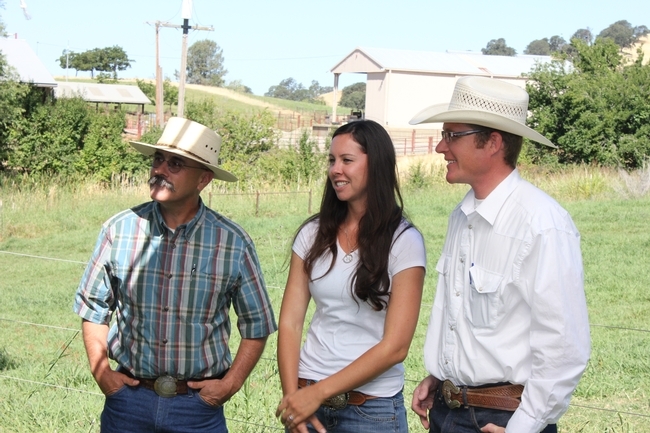 With July being “Smart Irrigation Month” this is the time for ranchers to explore opportunities for more efficient irrigation methods using resources like those offered in this post. 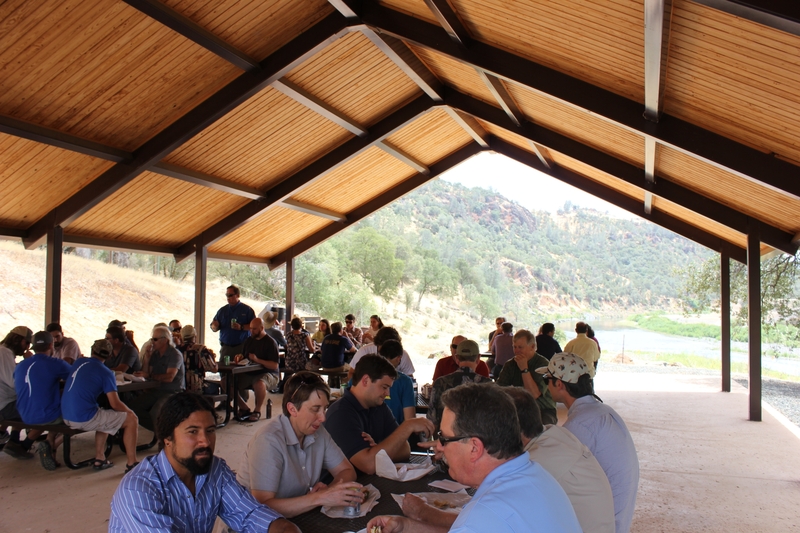 Follow this link for additional information about current projects focused on grazing and management of dryland and irrigated pasture at SFREC. Here is a previous blog post about sustainable irrigation practices at this center. This Basic Surface Irrigation Theory In Irrigated Pasture presentation by Allan Fulton, UC Irrigation And Water Resources Farm Advisor, offers basic pasture irrigation principles. 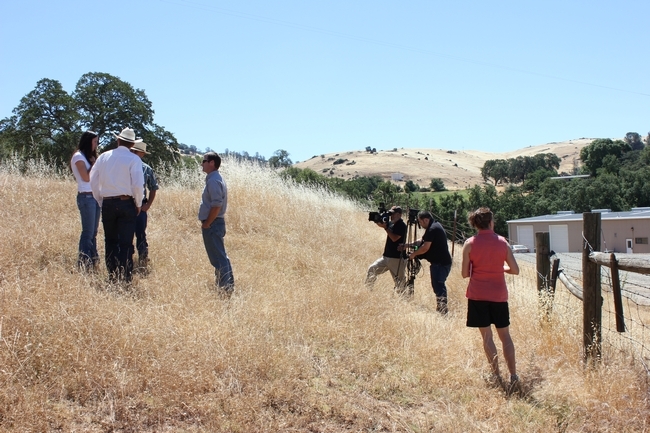 The Rangeland Watershed Laboratory with UC Davis provides additional publications, drought information, and links to other resources.